Looking for a different golf course review? Bandon Dunes Hole 3 (below): A great par 5 that is reachable only with two perfect shots. Fairly wide, but with gorse lurking on either side, the elevated tee shot is one of the prettiest anywhere as the Pacific Ocean provides the backdrop. The green is very well guarded in front by bunkers and is tough to putt. 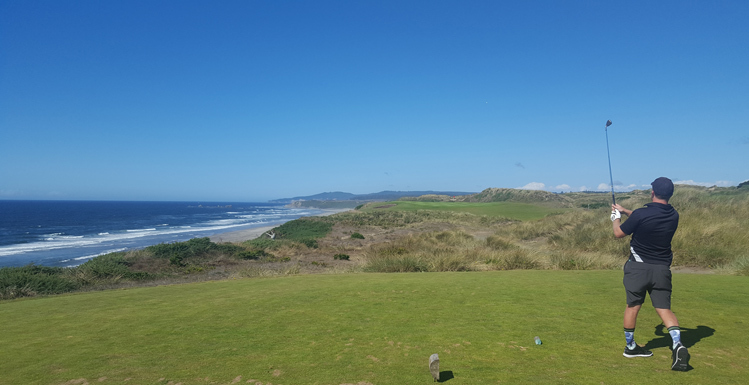 Bandon Dunes Hole 4: This outstanding two shot golf hole features a drive that tightens severely between two dunes for anyone wanting to hit driver. 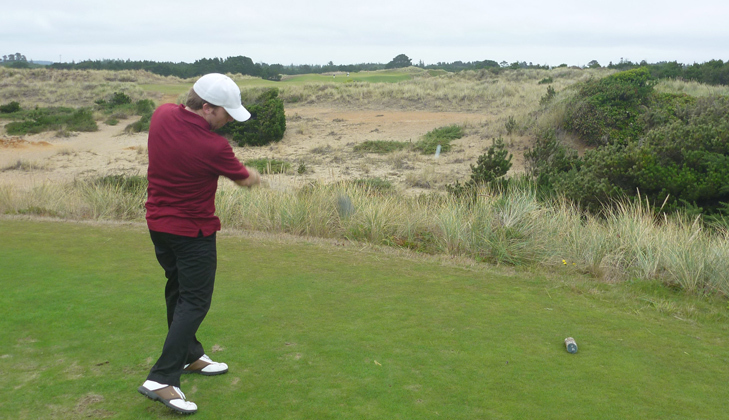 The approach features a shot between the dunes, down to a green on cliffs above the ocean. Big bunkers left provide a difficult approach to the slanted green, especially from the left side. 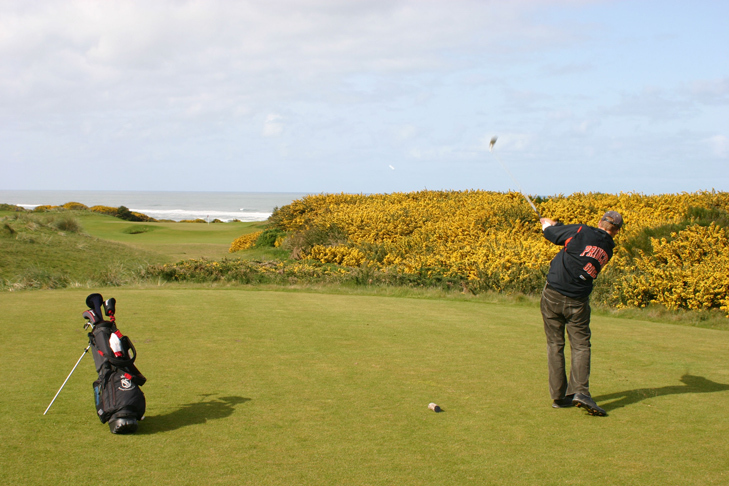 Bandon Dunes Hole 5: This incredible par four runs along the ocean and features various pockets of gorse and other small bushes in the middle of the fairway that must be avoided. 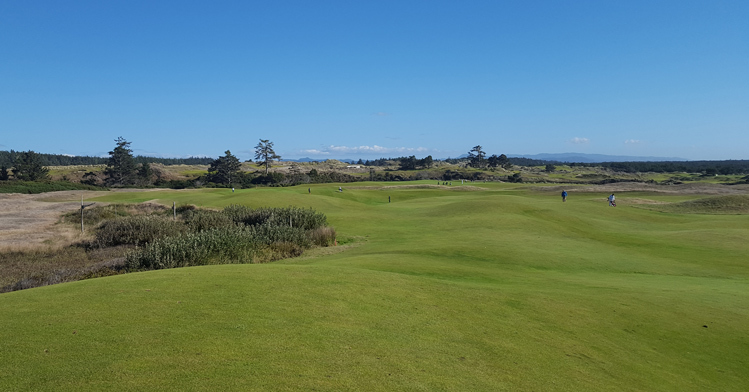 The fairway is wider to the right, but the angle to the green, which is huddled in a narrow corridor between bunkers and dunes, is more difficult from there. This hole is long, tough and great, and right along the ocean cliffs to the left. Bandon Dunes Hole 6: This par three is not terribly difficult with any pin cut center or right, but any pin placement to the left, cut over the bunker and close to the cliffs can change all that. The ocean views are, of course, superb. Bandon Dunes Hole 7: The seventh tee shot is scary the first time you play it due to all the junk between the tee and the fairway. However, in reality, it's pretty wide open and the focus should be on the uphill second shot as the large slope right of the green will send shots careening down it for a rough up and down attempt. 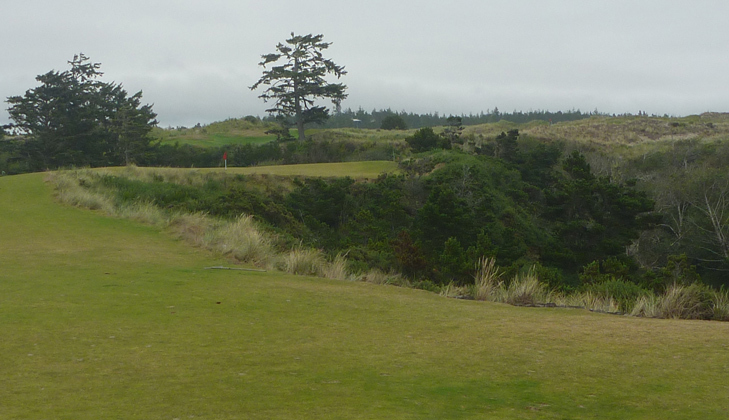 Bandon Dunes Hole 8: The tee shot on this slightly downhill hole is extremely wide, and relatively simple. The player must avoid the warlike series of bunkers 200 yards from the tee and the hidden bunkers on the right side of the fairway. The approach is to a unique green with a hump on the left side that acts as a separator between front and back pin placements. Accuracy on the approach is a must as three putts are ready to be had. Bandon Dunes Hole 12: The most difficult par three on the golf course looks like a classic redan-style hole, with one main difference: for those that go long, the penalty is not a bunker or swale, but a beach on the Pacific Ocean. At 200 yards, this makes for nervous players on the tee who will usually be hitting long iron or more. Bandon Dunes Hole 13: The first par five on the back nine has been improved over the years as the lake has been replaced with a more natural feeling marsh type hazard. Avoiding that on the drive and second is key to this otherwise fairly docile scoring opportunity, even if the green complex is still hilly, it's fairly open. Bandon Dunes Hole 15: This par three heads straight towards the ocean and features a very long green that is plagued by a huge, deep bunker to the right, and drop offs right and behind the green. The player can go a little left of the green and balls may come off the hill back onto the surface from there. 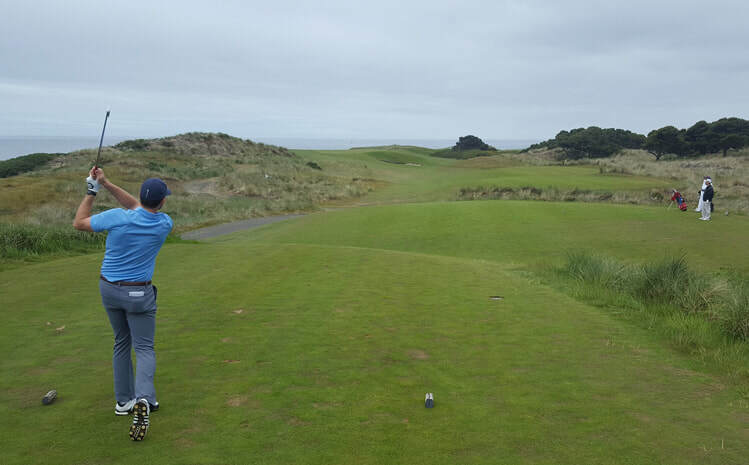 Bandon Dunes Hole 16: This phenomenal short par four along the ocean gives the driver his pick of poison. 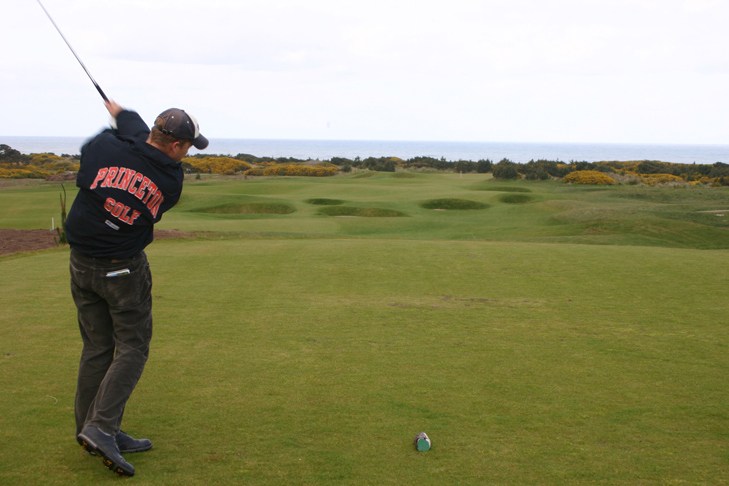 The lay-up offered will leave around 150 to the green, but the area of the lay-up is close to the ocean cliffs. The adventurous player can clear the waste area leaving 100 yards and go more to the left, but it is a good poke to clear the trouble and there is more trouble to the far left. The approach is terrifying (and more so from the right) as the green is perched on the cliffs where anything going a little offline is dead. 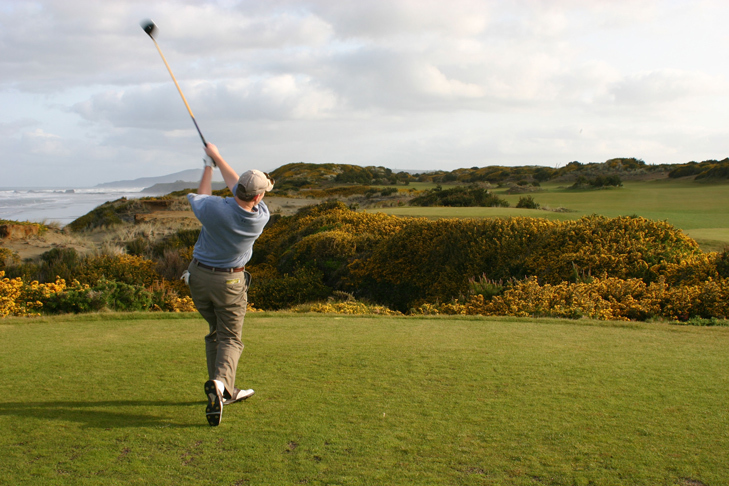 Bandon Dunes Hole 17: The last par four of the day has a wide fairway for the tee shot hit about 220 yards or less. After that, the bunkers on the left and cliff on the right pinch in. The green is set over a gorse filled hillside and the green itself is very deep. 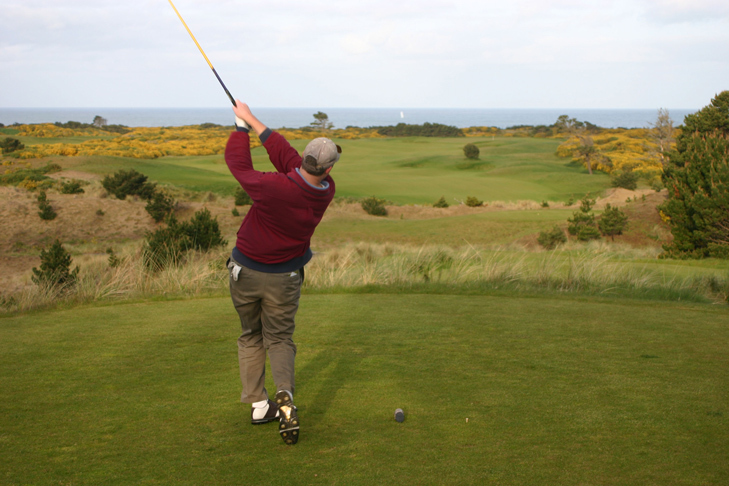 So, if the pin is up, the gorse is in play (but the shot is shorter) and if the pin is back, the shot requires more club but has less overall danger.